Make plans to join Abel’s Offering for a concert on Sunday afternoon, September 14. 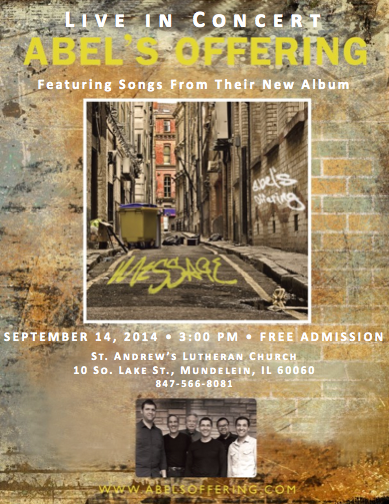 The concert will be held at St. Andrew’s Lutheran Church, 10 S. Lake Street in Mundelein, Illinois. Doors open at 2 p.m. Concert begins at 3:00 p.m.
For more information, visit the church website or call (847) 566-8081.